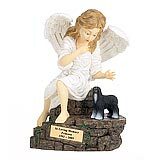 "I don't remember whether I wrote to tell you we received the new figurine or not (senior moment), but we did and it was in perfect condition. 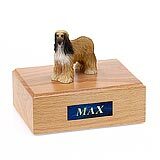 Thanks for your help and when the time comes for our other Greyhound, we will remember the great service and genuine concern that we received from you." 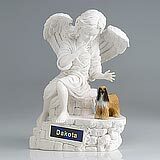 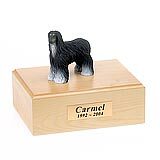 All available Afghan Hound dog urns and memorials will be displayed with the figurine on the Afghan Hound urn you select and in the appropriate size.